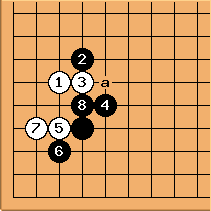 Hikaru79: Evidently, White has gotten the short end of the stick in the beginning of this four-stone handicap game. How can White come back in a position like this? It's so early in the game. I suspect this was the order of moves in the lower left. unkx80: To improve moves like must be eliminated. at c causes a split shape. 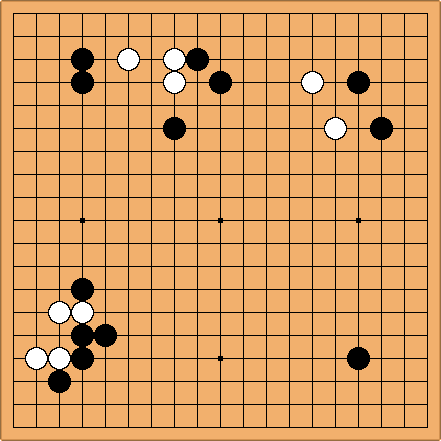 Therefore has to be at c.
I'd say is a little strange but Black played worse than White here. I can't find any terrible position for White locally so the disadvantage seems to come entirely from the initial handicap. Although the top center left stones are begging for attention too, I'd say they have a and b to get out, so I'd go for cutting at c.
Joonas Tyystjärvi: since it's a four-stone handicap game, I'd say White's position is not that bad. Black's shape in the lower left is bad (now c is sente) and White has interesting plays at a and b. The stones seem a bit problematic - the shape is quite thin and the stones aren't under much pressure. The lower right corner is also interesting. Playing a wedge at d also seems possible, but may be too slow for a handicap game. In any case, I think White hasn't fallen from the initial disadvantage - if the handicap's right, the game's still winnable. Alex Weldon: c in Zook's (not Joonas') diagram certainly blights the black stone that gets cut off, but even if Black goes there, you can still cut, and the stones on the left are pretty safe anyway, so I wouldn't call it urgent. 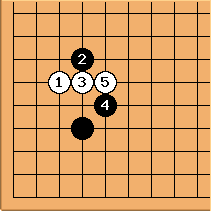 I like a in Joonas' diagram, but while b is tesuji, it might be just as good to play the plain move one to the left of that (a in Zook's diagram). What I would probably play, though, would be a move a few lines to the left of d, because the black stones in the lower left can be attacked because of their bad shape (right now, they're kind of heavy, whereas if Black gets an extension from them on the bottom, they're kind of thick, instead), and you have the cut (marked point) to aim at, as long as you don't play c first (for this reason, I would call c aji keshi). There is a general principle (small gap) that if you push in between two positions, pushing through the smaller space is stronger. That applies here. 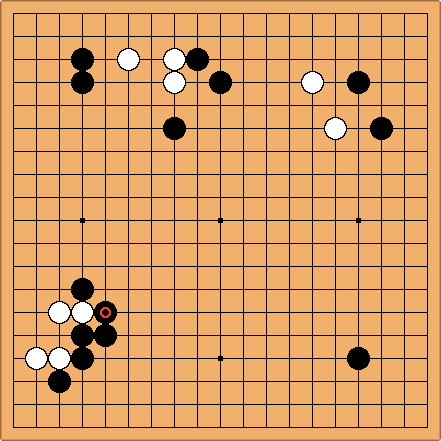 If White pushes through at , both stones are obviously inefficient. Compare this position with one where Black plays a turn there. Hikaru79: Thanks for the help, everyone. However, just for the sake of correctness, this was the actual sequence of moves in the bottom-left. Hikaru79: I know it matters, that's why I posted it. :) Especially in this case, where I missed to cut. =P I was't changing it as I did not post a move sequence at all. People took guesses, and I just provided them with the answer.